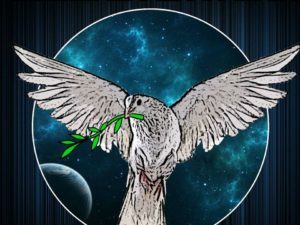 Frackville, Pa., April 3 — Car caravans carrying over 40 people travelled from Philadelphia and New York City today to SCI Mahanoy prison in Frackville, Pa., in an effort to save the life of Mumia Abu-Jamal. After months of medical neglect, this U.S. political prisoner, who has supporters worldwide, had been diagnosed with and hospitalized for diabetic shock on March 30. His family, friends and political supporters, many of whom have been actively fighting for Abu-Jamal’s freedom for decades, say that the prison authorities exacerbated his illness through bad diet and medical neglect and are trying to carry out an unofficial execution of the prisoner. They are calling for continued protests to prevent this execution. 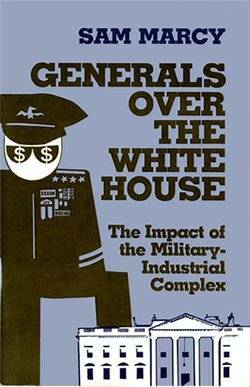 Abu-Jamal had been rushed to Schuylkill Hospital in Pottsville, Pa., on March 30 for undiagnosed adult-onset diabetes with blood sugar levels over 700. Normal levels fluctuate around 100, and standard diabetes charts show 300 as dangerously high and requiring immediate treatment. After only two days in the civilian hospital, Abu-Jamal was returned late on April 1 to the prison infirmary — the same one that had mistreated his illness for months while his condition worsened. Today, prison officials initially refused any in-prison visits to the world-renowned former death row prisoner. They relented after six carloads of supporters from Philadelphia, including a van of Philadelphia Student Union high school activists, and more cars from New York City converged at the entrance to the prison. Those able to visit included Abu-Jamal’s brother, Keith Cook, Mike Africa, Johanna Fernandez andI Abdul Jon. They reported on Abu-Jamal’s shockingly diminished state of health: His skin was discolored and extremely scarred by severe eczema, and he appeared to have lost 80 pounds. Abu-Jamal spent almost 30 years on Pennsylvania death row after he was convicted of first degree murder on July 3, 1982, stemming from the 1981 killing of a white police officer in Philadelphia. He has consistently proclaimed his innocence. Amnesty International maintains that Abu-Jamal’s original trial, which was irredeemably tainted by politics and racism, failed to meet international fair trial standards. State and federal appeals for a new trial to prove his innocence have been systematically denied by the courts. Immediately after Abu-Jamal’s execution was scheduled in the summer of 1995, a march of 25,000 people in Philadelphia forced the state to rescind the execution. 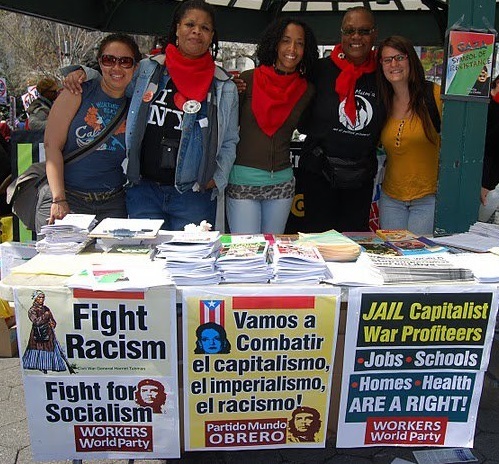 Another 17 years of worldwide protests finally won Abu-Jamal’s release from death row in 2012. 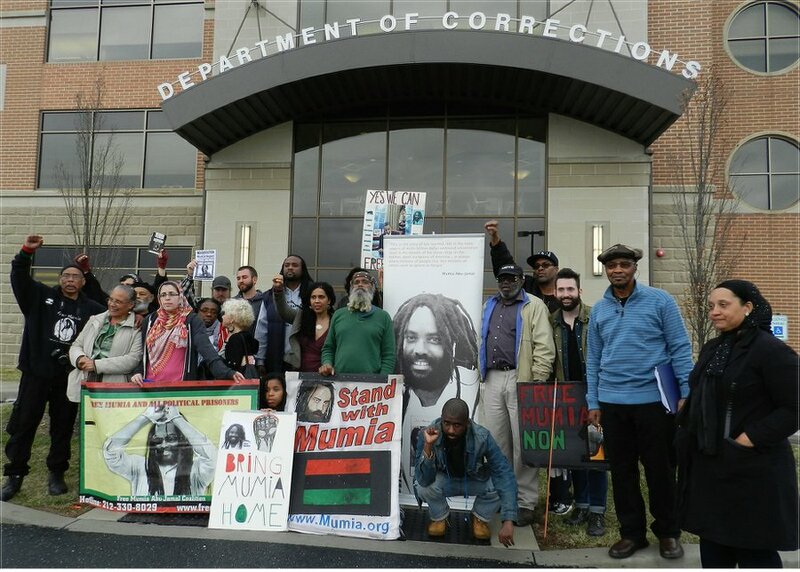 Thousands of phone calls and emails to the Department of Corrections since Abu-Jamal was hospitalized forced officials to relent on their refusals to allow family members and friends to visit him. Nonetheless, the Pennsylvania Department of Corrections appears intent on executing him by medical neglect. Had prison doctors diagnosed and treated him for type 2 diabetes — which would be the standard diagnosis for such commom symptoms as eczema, skin rashes and frequent urination that Mumia experienced over the previous three months — he would not have needed to be rushed unconscious to the hospital. Speakers demanded the right of all prisoners to decent health care. They insist prison officials allow specialist doctors of Abu-Jamal’s choice to assess, diagnose and treat whatever is the cause of these symptoms. Following the rally at SCI Mahanoy, the assembly packed up picket signs and banners and traveled 80 miles south to the headquarters of the Pennsylvania Department of Corrections in Mechanicsburg, Pa. Officials initially refused to meet with protesters, but as the crowd grew in size — and obviously showed they were not in a mood to leave — DOC Press Secretary Susan McNaughton agreed to meet with about 20 supporters who argued for Mumia’s life, with many documenting the encounter. “Today is Good Friday, the day Jesus was executed. Haven’t you learned anything from that?” said Kevin Price. “It was a state execution back then too!” yelled someone from the back of the crowd. “We’ll be here every day until we get what Mumia’s needs,” said Pam Africa. The demonstrators demanded a face-to-face meeting with DOC Commissioner John Wetzel on April 6, and only left after McNaughton promised to relay the requests to her supervisors. A press release from the Campaign to Bring Mumia Home, the Free Mumia Coalition, MOVE, International Concerned Family and Friends of Mumia Abu-Jamal and the Philadelphia International Action Center listed the following demands: no execution by medical neglect and torture; daily visits by Mumia’s family, friends and attorneys; quality health care and treatment for all prisoners; and the release of Mumia Abu-Jamal, all political prisoners and the terminally ill and elderly (over 55) from Pennsylvania prisons! 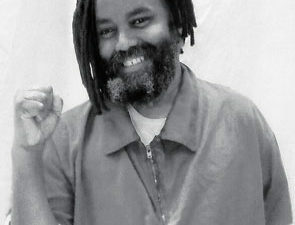 People are urged to continue making calls to Secretary of Department of Corrections John Wetzel at 717-728-4109 to demand Mumia be immediately allowed to be treated by doctors of his choice. On Feb. 13, Pennsylvania Gov. Tom Wolf declared a moratorium on the death penalty. Call his office to demand a halt to the state’s attempt to execute Mumia through medical neglect: 717-772-2500. Donations to help pay for lifesaving medical care and other costs can be made through tinyurl.com/nv7jqem.